Homemade yogurt and granola, anyone? A great way to treat yourself during the week OR make a sweet treat for someone you love. And it’s hard to beat foods that go in mason jars, they are so portable and portion controlled. 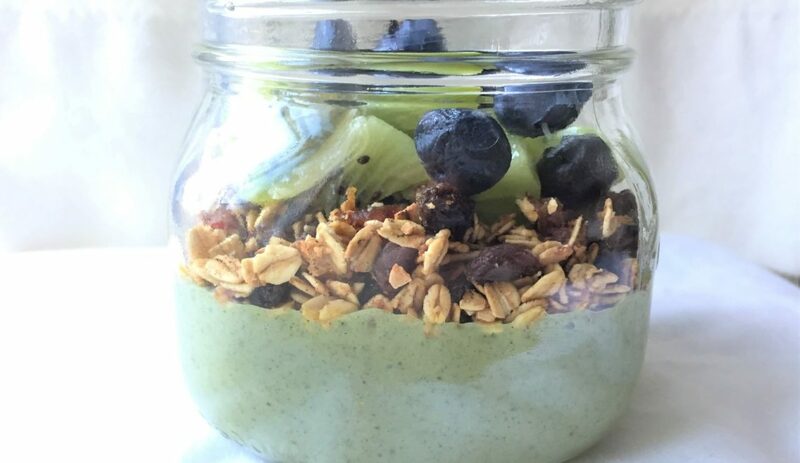 For this recipe, I used one layer of yogurt and one layer of granola, but feel free to layer on the layers! This granola is delightfully crispy, but doesn’t contain any processed oil. Keeping it extra healthy – this granola is baked, not fried. And despite its wonderful crunch, there is no processed oil anywhere in this recipe. You can get really creative here and add you favorite variations of dried fruit, shredded coconut or freeze-dried fruit. I personally love raisins and dried dates, but let your imagination soar with combinations – that’s what makes parfaits so fun! 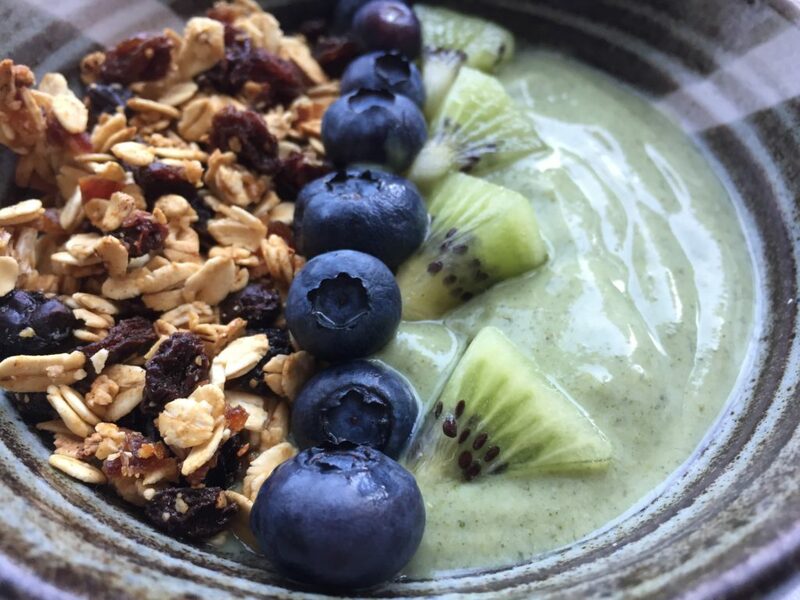 You can get really creative with the granola. I used raisins and dates, but you could also use dried pineapple, shredded coconut, and/or freeze-dried strawberries. 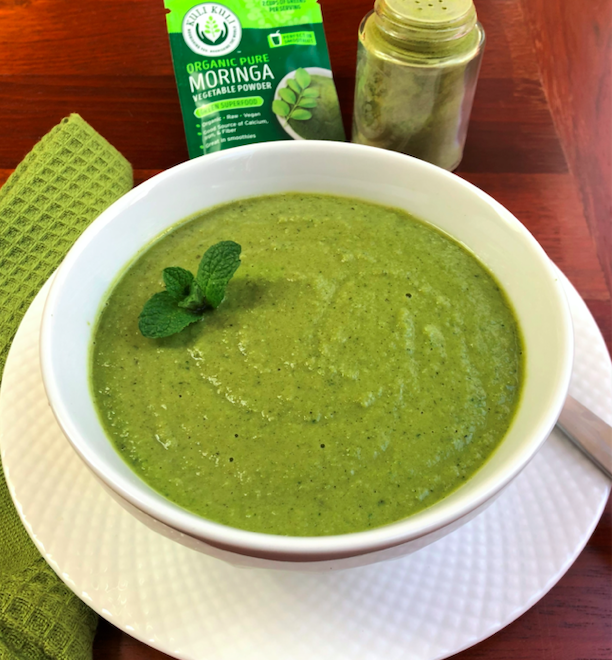 I can’t get enough of the green color that the moringa powder adds naturally to the yogurt and thought it paired well with a diced kiwi and a few blueberries. The yogurt is also pretty special because it’s vegan and sweetened with just a bit of maple syrup. Combine the tofu, maple syrup, vanilla, and moringa powder in a food processor and blend until smooth. Let the yogurt chill in the refrigerator for at least one hour before serving. If you can’t wait, eat/serve it right away. Preheat the oven to 400°F and line a baking sheets with silicone mats or parchment paper. 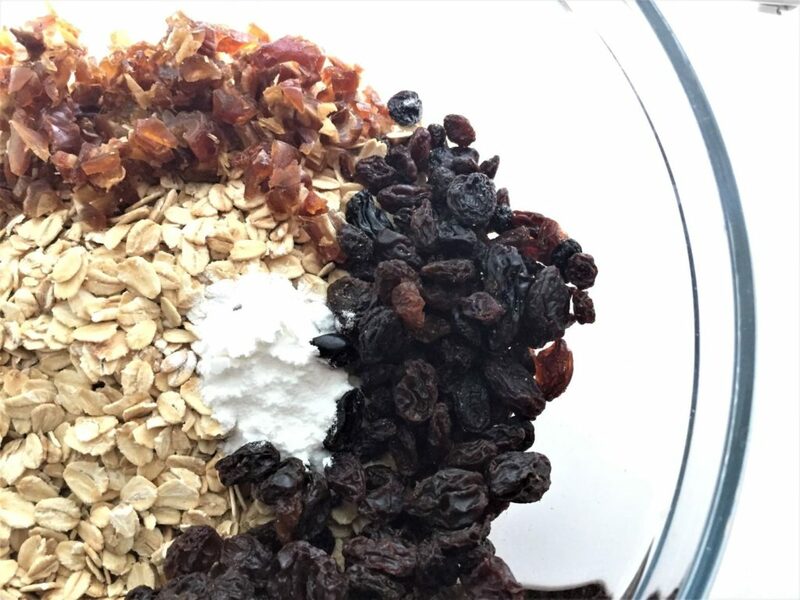 In a large mixing bowl, stir together the oatmeal, baking soda, dried fruit, and maple syrup until everything is coated in maple syrup. 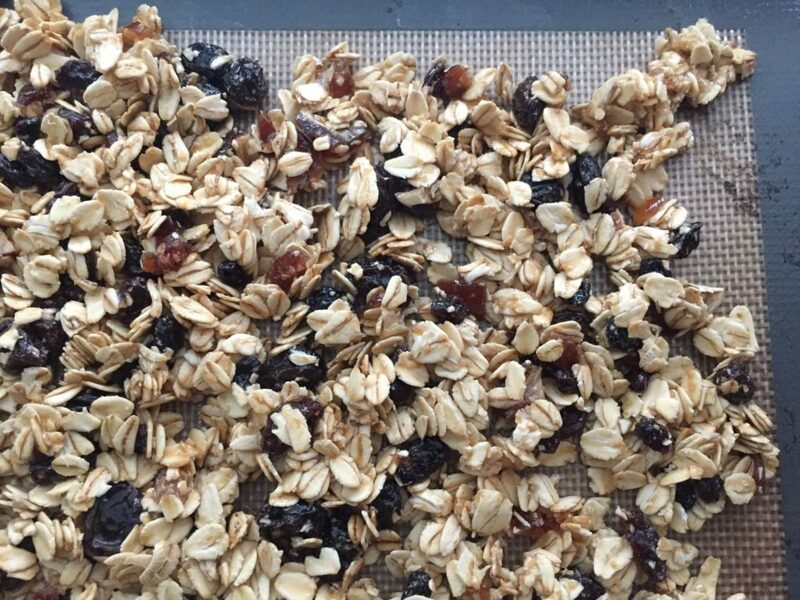 Spread your granola out over the prepared baking sheet and bake for 8 minutes. Then take the granola out of the oven to turn/stir the granola and then bake for another 2 minutes. Let the granola sit for a little while after you take it out of the oven as it will become crunchier as it sits on the hot pan for at least 5 minutes while it’s out of the oven. As mentioned before, you can get really creative with this part. I layered some yogurt on the bottom of a mason jar, added the granola, and then topped with some fresh berries. I liked the mason jar because it’s transportable, but feel free to use a pretty glass or bowl instead. You could also do the more traditional parfait thing and add more layers of yogurt and granola. If you want to use date paste and make it yourself, combine 1/2 cup dried dates and 3/4 cup water in a blender and blend until smooth. This makes for a really sweet gift for a friend, family member or for you, if you need a little extra self-love.